University College London has been forced to apologise for saying 'white' Christmas in case it racially offended its students. 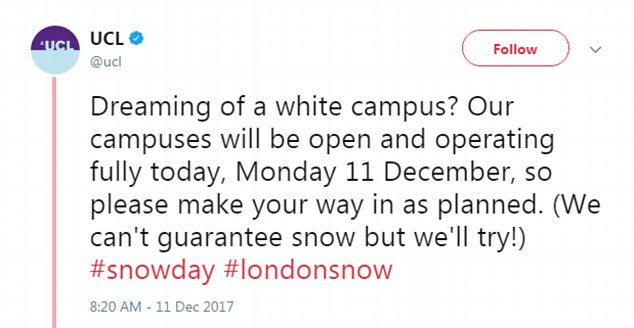 The university, ranked 16th in the world, posted a message on its Twitter page letting students know the campus was open despite some parts of Britain being covered by 13 inches of snow. But it quickly apologised and said that it 'chose our words very poorly' and the university said it was 'sorry' for the tweet. But the apology has been slammed online, with social media users saying that 'snowflakes are getting snowflaky over snow'. I say we drop everything until this is fixed. Ben Reilly wrote: I say we drop everything until this is fixed. I say, people should stop defending those overly sensitive, who see racism everywhere and in everything. Which apparantly includes when it snows. As they do nothing to tackle the problem of actual racism itself. It's ridiculous. They'll be banning the song White Christmas next. This has all gone too far, and people scared in case they say the wrong thing, that might upset sensitive little people who cause much of the problem with racism.